Hello all! Our latest outreach update is below, along with upcoming outreaches. For those of you reading this via email, my apologies for the wait since our last email. Online posts are easier to put up, and I’ve been lax in my updates. I’ll try to do better going forward. Our last online update can be read HERE. I pray both that update, and this one, will encourage you. 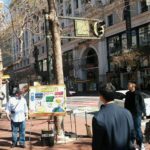 2/24 – Palo Alto Outreach – This ended up being a very interesting outreach. 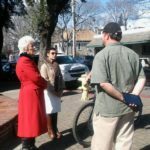 There is a local Hare Krishna group that is very active in getting out into the community to share their faith, and we have run into them a number of times. This night was one of their monthly celebration/outreach events, and they were setting up just as I arrived to set up as well. 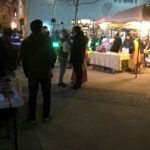 They had pulled permits with the city, and had a couple canopies, amplified sound, disco lights (no, I’m not kidding), food and, of course, lots of free literature (you can see a bit of the party atmosphere HERE). As I was setting up my table and sketch board, a couple of members came over and asked me to move, since I was in a location where they usually put an additional table. I politely let them know that they had rights to the plaza, but not the sidewalk, and that I would not be moving. They weren’t happy, but let it go, and I’m glad we didn’t move. The location, where we’ve set up before, was perfect, especially with all their goings-on. And despite the fact that they set up right next to us anyway, it was a good night with many profitable conversation. 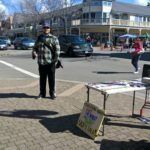 Thanks to James and the folks from his church that came out to help proclaim the Gospel! The Hare Krishnas have quite the setup! This group hands out a large amount of literature. 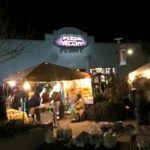 2/25 – Pleasanton Farmers Market Outreach – The weather has been really bad, and the drive to Santa Cruz is treacherous under the best of conditions (Highway 17 has a history of bad accidents even without mudslides) so we went to Pleasanton instead. They have a weekly Farmers Market downtown, and it ended up being a pretty good spot to hand out tracts. Out best conversation was with Donna and Carmen, two Jehovah’s Witness ladies who were set up near us. They were very polite, and it was a pleasant conversation, but they were absolutely convinced that the Watchtower was God’s organization, despite admitting that they had made mistakes in the past! Please pray for them. Thanks to our friend Chris, who joined us in talking with the JWs, and who lent me his video camera for a home inventory (one of my side jobs). 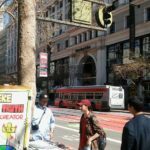 3/1 – San Francisco Outreach – It had been a while since we headed out to the Market and Powell Cable Car turn-around in San Francisco, and it was good to be back. 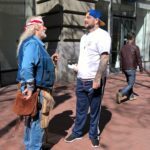 Tim and I had a good day of outreach, and good conversations. We had a particularly good conversation with Ian and Yat. Ian was a skeptic, and Yat was a believer who watched one of my sketches, and then joined the conversation. He was encouraged by the outreach, and was pretty well versed on apologetics. 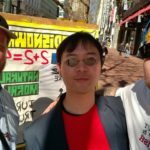 Ian went away with some good information, and it sounds like we may have Yat join us again. Tim the tracting machine, at it again. We’ve met this brother in Christ before (though I can’t recall his name). He came by to encourage us. This is Yat. It’s always great to meet another believer! Preaching with the sketch board. 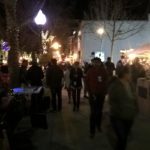 3/3 – Campbell First Fridays Outreach – This was another good night in the downtown area near my church. Judy came out to help, and tracts were taken more readily than usual. I have not used the sketch board in this venue much, but decided to bring it anyway, and I think it really helped. I’ll be bringing it this weekend too. 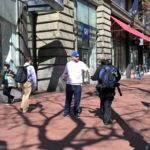 We had a particularly cool interaction with a couple young men who stopped by. They were in their 20s, but had been students of Judy’s back before she retired. They recognized her, and stopped to talk. 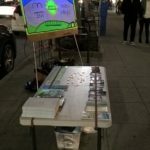 Of course, they left with Gospel tracts too. 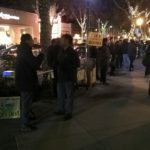 3/4 – Downtown Santa Cruz Outreach – Even though I was out solo, this was a really good night. I had a fair number of people stop to watch the sketches, and had really good conversations. The last conversation I had was with Jake and Syrus, and it was particularly good. Syrus did most of the talking to start, though Jake joined in later. Both had some religious background, and both had a lot of questions, from the morality or war (Jake will be joining the military soon), to the background and reliability of the Bible, the possibility of evolution, and a host of other things. Both really seemed to be impacted by the talk, and both wanted to get together and talk more. Please pray that I hear from them, and am able to sit down with them soon. Additional support. As always, God has provided for every need, but I’m still praying I will be able to minister full time, without other distractions. Health. The family has had a tough time with sickness and injury lately. Upcoming student teaching and outreaches. It looks like we’ll be working with some students at Stanford soon, and I’ll be training our church youth group in evangelism and apologetics for three weeks in the near future. Give praise to God for our daily bread (and more side job opportunities), for a very loving and supportive family and church, and for many good days of ministry! Please pass this information to anyone who might be interested or encouraged. Thanks! !